Installation: You will be directed by BMT Micro to download a self extracting .exe file. Double click on the file to unzip the contents to any convenient location i.e. Desktop or a games folder. Inside the newly created OccultChronicles folder you will find a file called OccultChroniclesWindowed.exe. Double click on this file to start the game in a window. There are also executables to start the game in full screen or forced 800 by 600 for netbooks. The game is portable and can be played off of a flash drive. Please read and understand the user license agreement that is included in the game folder. There is no DRM or serial key required for The Occult Chronicles. The Occult Chronicles is a computer turn based strategy game whose design is heavily influenced by both modern adventure board games and the classic rogue like formula. You take on the role of an Occult Defense Directorate (O.D.D.) agent who has been assigned a mission to investigate an ancient estate out in the country. You start your adventure in the Main Entry Foyer and then proceed to explore the creaky old mansion encountering all manner of strange and haunted things. Your mission will take you to the caverns and dungeons below the mansion where you must confront and defeat an unspeakable evil. Before you begin the game you must first create your agent character. You are given a fixed number of points to build a character to suit your play style. Each character has four key attributes that govern how he or she will approach the many challenges ahead. The four attributes correspond to the different suits of a Tarot deck which plays a key role in how challenges are resolved. The Swords attribute corresponds to physical combat of any kind i.e. guns, swords, knives, hand to hand and even explosives. The Wands attribute corresponds to any mental challenge i.e. resisting the many horrors that you will witness, deciphering an arcane text, figuring out the inner workings of some ancient artifice, negotiating with a demon, etc. Psychic abilities fall into this category as well. The Cups attribute corresponds to any physical challenges that the character’s body might need to overcome i.e. quickness in evading a trap, running away from a problem, resisting the poison coursing through his veins etc. The Pentacles attribute corresponds to any arcane challenges i.e. the ability to cast spells, use sorcery, and channel occult energies. Additionally, each character starts with and may gain an unlimited number of health or sanity points. 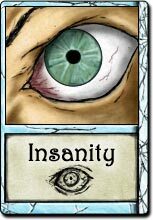 If at any time a character has zero health or sanity points, that character is killed or driven insane. 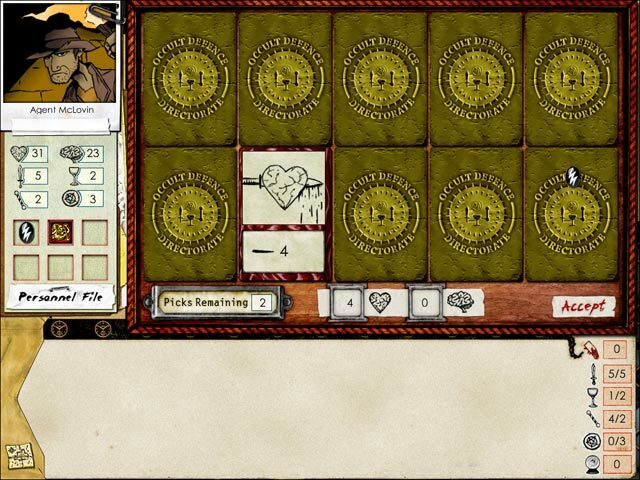 Playing for keeps - The game is meant to be played in “Reaper” mode. In this mode, death and insanity mean game over. Your save game is deleted and your character is sent to the archives if he or she merits such inclusion. The archives lets you view the histories of your best agents…the glorious missions accomplished and the ignominious deaths in some forlorn hallway when your gun jammed and the darkness closed in. The game within the game - Whenever your agent confronts an encounter within the game several different options are usually presented. In general these correspond to the different suits of the Tarot deck. A combat option would be dictated by Swords, while an option that involved sorcery would be controlled by Pentacles. 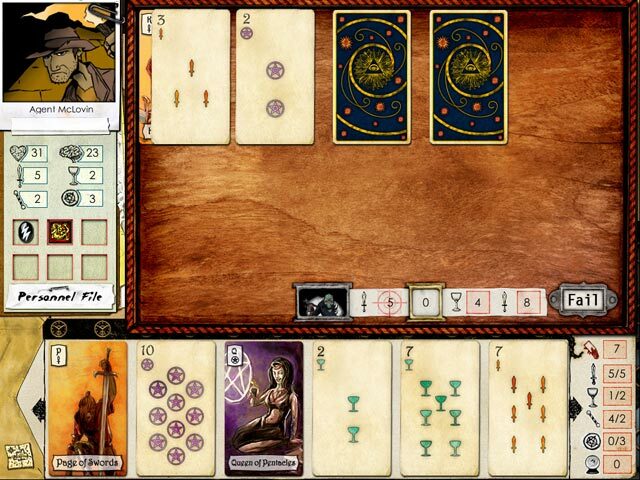 Choosing a specific option results in setting a target trick points number (the amount of trick points that you need to win the challenge), determining the number of tricks played to the field and specifying the number of cards drawn to you hand. The final numbers are directly related to the values of your attributes. The Tarot game board is then set up and you proceed to play cards from your hand to take tricks. You take a trick by first flipping the card over and then matching the same suit with a card from your hand. Should the card you played be equal or greater in numerical value than the trick card, then youtake the trick and add the points to your total. If you have a card in your hand that matches the suit of the card that was flipped over, then you MUST play it even if it does not take the trick. If you do not have a matching suit card then you proceed to flip over another trick card. This continues until you can no longer take any more tricks. If your point total equals or exceeds the target then you win the challenge. I’ll take what’s behind door number 1? – Whether you win or fail the challenge, the game moves on to the Results Phase. Here you are presented with 10 face down cards. If you won the challenge the cards you select will be positive i.e. health or sanity points gained, special items, spells, or heroic action cards gained etc.. If you failed the challenge then the results will be negative i.e. health and sanity points lost, wounds and impairments gained, etc.. The number of cards that you may or must draw depends on how well or poorly you did in the trick taking game. So there you have it. 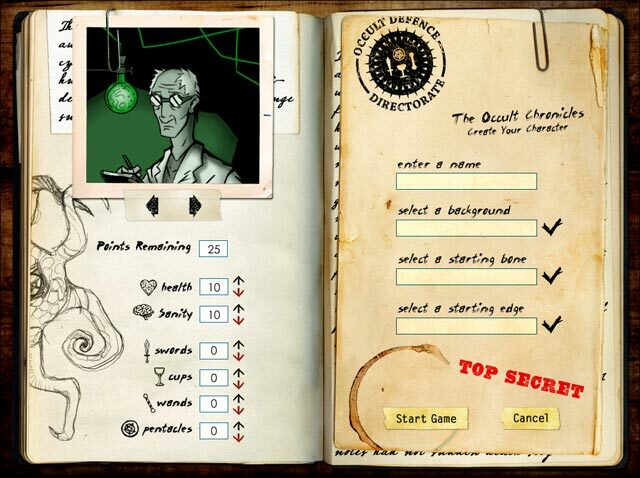 Of course, being a Cryptic Comet game there are a lot of subtle details and complex mechanics to delve into. 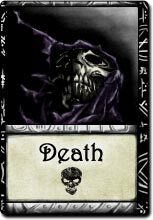 For example, many of the items, spells, psychic talents and heroic action cards that you acquire will allow you to try and change the Tarot cards in your favor. You can bump the values up or down, draw new cards to your hand or the trick table or even add points directly to you tricks taken point value. Inventory - Your inventory is simple and laid out on a pad directly in front of you. There are five different categories for storing inventory items. The main four correspond to the Tarot suits and the fifth is Major Arcana, which is a type of trump card that also can initiate powerful one time effects when played. Each item in the game has an encumbrance value. You can have up to your attribute number of encumbrance points in each category. For example, if your Swords attribute was 5, then you could have up to 5 encumbrance points worth of items cards in your inventory. Level Up! - As you play the game, you will often acquire expertise tokens during the results phase. You can spend these tokens to increase your attributes and gain special edges and abilities. Every character starts the game with a profession card that enables this but additional specialized skill cards can be bought as well. 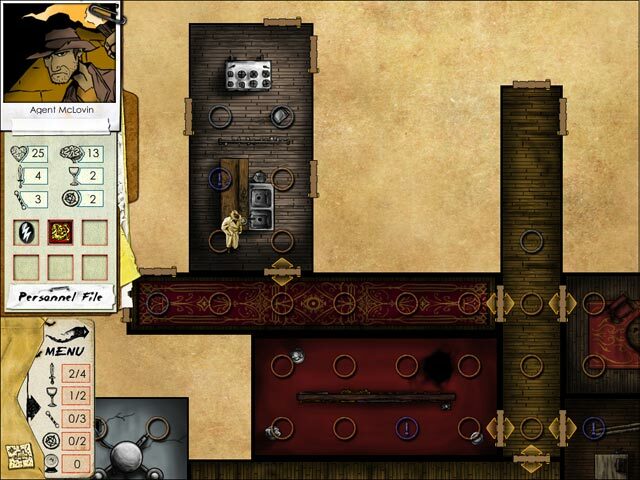 Getting a Clue - It pays to explore in The Occult Chronicles. 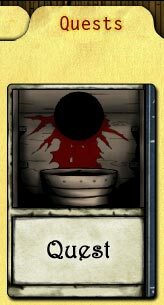 Off the beaten path nooks and crannies will often yield important clue cards that will give you a significant upper hand when confronting the final mission challenge. These challenges decide whether you win or lose the game so finding clues can be an effective strategy in bringing off a win when the odds look grim. 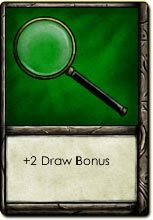 Clue cards are placed in your personnel folder for viewing. On a Quest! – As you explore the mansion you will find that some of its denizens can be communicated with. This sometimes depends on whether you have a sufficient attribute in one of the Tarot categories. An option to communicate will appear on the encounter dialogue that enables you to pass a challenge to activate the quest. 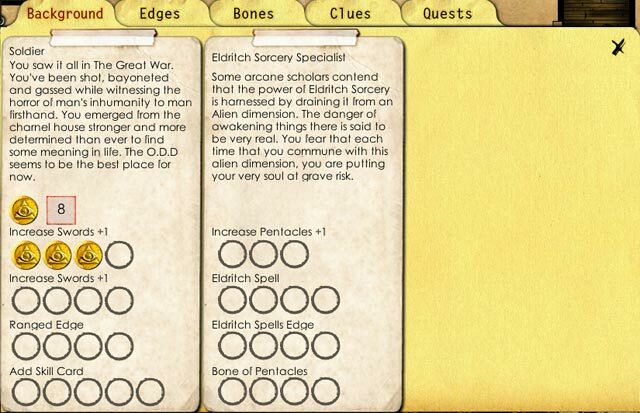 A quest card will be created and place in your personnel folder with instructions on how to proceed. Finishing quests can provide powerful rewards that will help you navigate the dangers and horrors of the levels below the mansion. 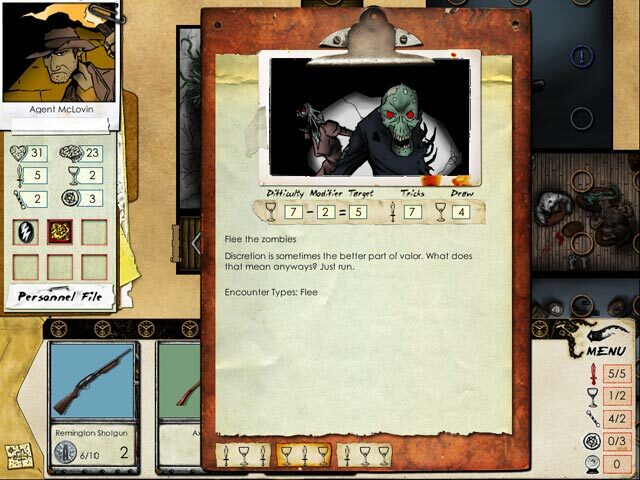 The Occult Chronicles is a strategy game of adventure and exploration. Games usually take just a few hours to complete and dying a horrible death is all part of the experience. You will quickly get a feel for how far you can push your luck and often you will still push it too far because you think that snake eyes will never happen to you. Sometimes you’ll just run into some plain bad luck and find your desiccated bones littering a shabby corner of some forlorn mansion. So you’ll need to master the ability of knowing when to hold them, when to fold them and when to run away in stark raving terror. All that matters is that you complete your mission and make it out alive….or not. The Occult Chronicles will be available this spring for a special late Beta buy in offer. The game will be content complete and very few bugs should remain. However, Cryptic Comet would like to hear from any buy in beta players and solicit input on any remaining bugs, and usability and balance issues.